The proposed EU-US Privacy Shield, intended to replace the Safe Harbour regime invalidated by the Court of Justice of the EU in Schrems, is currently being considered by a committee of representatives of EU Member States under Article 31 of the Data Protection Directive - known, of course, as the "Article 31 Committee". When considering proposals by the European Commission, such as its draft adequacy decision to approve the Privacy Shield, this Committee must use the "examination procedure" under the EU "comitology" process, governed by Regulation (EU) No 182/2011. Comitology is somewhat convoluted, so I've produced a flowchart explaining the different options, depending on what opinion the Article 31 Committee issues - expected to be in June 2016, but at this rate it may be later! Explanatory paragraph added 13 June 2016: Note that the Data Protection Directive was amended from November 2003 by Regulation (EC) No 1882/2003. That changed the Article 31 Committee procedure from the one in the original Data Protection Directive, that gave the Council the final say, to the procedure set out in Decision 1999/468/EC. The 1999 Decision was itself amended a couple of times, and eventually replaced by Regulation (EU) No 182/2011. My flowchart reflects the Regulation 182/2011 procedure, which is now the applicable procedure for comitology under Article 31 of the Data Protection Directive. 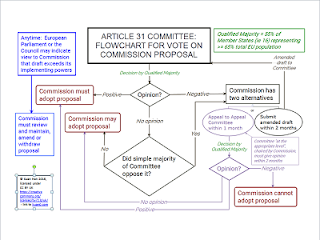 There are other flowcharts on comitology, but mine just shows what's relevant to the Article 31 Committee and not other areas of law, and I believe it's clear but still informative. Click on the small image below to download the full PDF flowchart (note: amended 2 June 2016 to expand on what "positive", "negative" and "no opinion" mean).